Recent data out of ChangeWave Research indicates that the Kindle Fire is still idling at a much lower level of consumer interest than was the case in the fourth quarter of last year. Obviously nobody expected the rate to jump back up to as high as it was immediately after the holiday release of a much anticipated product, but the fact that there has been no noticeable change since the beginning of this year is being taken to mean that the Kindle Fire is essentially dead in the water. 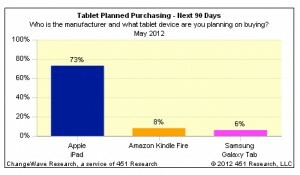 ChangeWave Data (as seen on the right) puts the interest in Kindle Fire purchases among potential customers at about 8%. This compares less than favorably to the iPad’s 73%. I don’t think it is fair to say that this comparison should be made given that they serve completely different customer needs, but let’s take this for what it is. The Kindle Fire is still running ahead of all other Android devices by a fair margin. Even in the limited information we get from this ChangeWave survey, interest appears to be at least 30% higher for the Amazon product compared to its closest non-iPad competition. In that respect, it is doing quite well. This doesn’t mean that there are great times in store for the future of the product, however. The biggest issue right now seems to be the fact that Android is failing to match up with the competition. The best sellers are the Kindle Fire, which goes a long way to distance itself from Android, and the Samsung Galaxy Tab, which appears to be considered as one unit in the publicly available information of this report despite actually being a line of four separate products. Nobody else stands out. I would predict that tablet customers get even more cautious in the months to come. We’re still waiting on an official announcement about the Kindle Fire 2. The release of Windows 8 tablets into the market is going to upset things in a way that nobody can quite predict yet. Even Apple might do something unexpected if the incredibly far-fetched iPad Mini ever actually appears. About the only company that customers can be completely sure of ongoing support from right now is Apple and even there it is hard to be certain that you’ll be making the best use of your money. In the short term, I expect the Kindle Fire to become more of a niche product. It is a media consumption tablet rather than a fully functional computing device. You can’t reasonable replace even a small computer with it like you can an iPad. This doesn’t make it any less useful, but customers are now realizing that there are specific reasons to get a Kindle Fire and that you can’t expect it to function as an iPad competitor. It was never really meant to. In the long term we have to wait and see where Amazon goes with the next Kindle Fire. If the reports of a larger, more powerful device are true then perhaps they will be trying for a serious PC replacement. It might not be the best time to be marketing something like that against all the new Windows 8 PCs, given how well Windows 8 is said to perform on a touchscreen device, but there is the chance that Amazon’s forking of Android will be sufficient to generate their own unique category in customer perception. Even if they had no prayer of ever taking majority control of the tablet market, and realistically I don’t think anybody believes they have a prayer of doing so, Amazon isn’t about to drop the product line. It is still gaining popularity, however slowly. Media is still selling through it more steadily than through any other Android device. However much Kindle Fire sales numbers might not match up to holiday interest, that’s only part of what matters when it comes to success. This entry was posted in Kindle Fire, Kindle Sales and tagged changewave, customer interest, function, Kindle Fire, Kindle Fire 2, kindle fire vs ipad, tablet sales by matthew. Bookmark the permalink.